CPA Tax Advisors > NewsOLD > News > Flat tax — Why not? LOTS of REASONS! One of the arguments for a flat tax — that always makes me cringe at the ignorance — is the idea that if we go to one rate, we can just shut the IRS’ doors. I, for one, would champion closing the IRS’ doors, however, I, and a flat tax will do nothing in that regard. Payments will still need to go to some agency. Some agency will still need to collect the money. Some agency will still be checking your math, some agency will still look at your deductions, some agency will still review your accuracy and some agency will still be responsible for your compliance. A second argument says that there would be no deductions, just one simple tax on earnings. So, for example, all of you homeowners can no longer deduct your mortgage interest, real estate taxes — and you Realtors have now lost that selling point. Guess what, if you can no longer deduct those items, you were just handed a sly tax INCREASE. Third, I hear, “Well, a flat tax, in the form of a national sales tax would encourage savings and investment“. Really? C’mon. You have a national sales tax of 20% – 40% so you don’t spend your money and you save it instead…..perhaps even invest it as the theory goes. Invest? In what? If your not spending money, businesses aren’t selling product, thus aren’t growing, producers aren’t producing and employers aren’t hiring. The economy is based on production and hiring. Those are the two reports we look for every month — the unemployment rate, and the GDP growth. Fourth some advocate a Value Added TAX (VAT). A VAT essentially is a sales tax where the tax is collected in stages from each producer on the supply chain rather than all at once from retailers. This pushes up the price of the goods that consumers eventually pay. Those added production costs are harder for lower-income earners to cover. As with the single income tax rate, the VAT-increased prices take a larger percentage of a poor or middle-class family’s income than they take of a rich family’s income. And poorer families tend to put more of their income toward consumption. Let the buyer beware! Fifth “But a flat tax would be simple“. Someone really needs to explain this logic. There are three types of earners in this country. Workers, generally paid by employers in a “pay for hire“ situation, Business Owners – otherwise known as risk takers, and Investors – those who invest in people and ideas. How would income tax be calculated for Business Owners and Investors? If it’s based on the gross revenue, well, we already have one of the highest corporate tax rates in the world. Now, according to this theory, no deductions, and the same rate. Again, a huge (and sly) tax INCREASE. Hmmmm. Doesn’t make me want to start a business or invest in one. “Ok“, you say, “maybe we should give them some deductions“. Which ones? Also, you no longer have a simple flat tax do you? 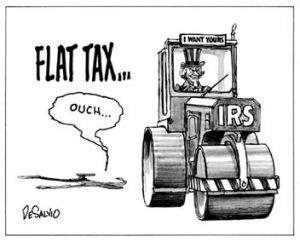 If you are in favor of high unemployment, low wages, decreased GDP, decreases in new business startup, or innovation and increased taxes, then you are for a flat tax. Tax reform, however, as I stated earlier YES! Here’s how to allow for the free flow of market ideas and competition. Repeal and replace Obamacare. Obamacare is a tax. If you have insurance you don’t pay the tax, but you cover everyone else via your premium, and if you don’t have insurance you pay a tax, AND you are no better off in meeting your health care needs. Nobody wins. Remove the barriers to health insurance by allowing 100% health care deductions. If you like your plan – KEEP IT (sounds familiar doesn’t it), unlike the bait and switch we were just handed, you really get to keep your plan….No more “Obamacare compliant plans”. Don’t require Medicare or Medicaid, if you have a plan. Increase savings and investment by removing or drastically reducing the limits on contributions to retirement plans. Allow for hardship withdrawls, and remove the forced “required minimum distribution”. Encourage investment in property plant and equipment by bringing back the investment tax credit. Allow those that invest in businesses to get a credit for purchasing new equipment – not just a depreciation deduction. Social Security should NEVER be taxable. You paid in, and your getting it back – IT’S NOT AN ENTITLEMENT, it’s a PAYBACK of your hard earned money! Eliminate the death tax and allow family’s to pass on their already taxed years of earnings to future generations. Finally, none of this would work without a government steadfastly resolved to eliminate wasteful spending, fraud and abuse. The fastest and easiest way to reduce your taxes is with a government that doesn’t waste your money! We can all agree, for example, we don’t need to spend $387,000 to study the effects of Swedish massages on rabbits, $200,000 to a research project that is trying to determine how and why Wikipedia is sexist, $804,254 for the development of a smartphone game called “Kiddio: Food Fight.”, $856,000 to teach mountain lions how to walk on treadmills. There, I just saved $2,000,000 without even trying. Aren’t there better uses for that $2,000,000? Wouldn’t we all like a piece of that back? Sure change is possible, reform is good, but a flat tax? No thanks. Leo is a CPA , and entrepreneur and business owner. His opinions advocate common sense ideas to ongoing national tax issues.